Boy, are those last words true. I’m dying! I want the next book and I want it now!!! I loved this book! The cover alone draws you in, right? The beautiful blue eyes just draw you in, and that is how the whole book is. 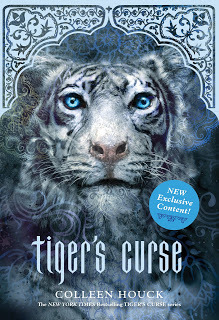 Ren’s character, even though a tiger, is so intriguing. I had to keep reading to find out more about him. He is so mysterious, yet he wears his emotions on his sleeve (or fur) so to speak. At first I didn’t know how it would work with a tiger as a main character, but Ms. Houck did a really good job of making it seem real. Kelsey’s character is a mix between Catniss from Hunger Games and Bella from Twilight, along with some Clary from City of Bones. She’s tough and stubborn like Catniss and Clary. She can take care of herself and be strong, but at the same time, she’s got a Bella streak that drives me crazy. It’s almost opposite of Bella, but she handles it in a similar way. I screamed at Bella and I definitely screamed at Kelsey. Just imagine me reading at night when everyone is asleep and suddenly screaming, “You stupid girl……Ahhhhhhh!!!!! !” She has been given this great thing (I won’t tell you what it is) and all she wants to do is get rid of it. It drove me crazy! But, I had to keep reading to see if she if she figured it all out. And…..well…..I’m not going to give away the ending except to say that you better just get book one and two at the same time. I also really like Mr. Kadam’s character. He is also shrouded in mystery, but he adds a lot to the book. I wasn’t so sure about him in the beginning. As a mom I had red flags shooting up everywhere warning danger, but………(I won’t ruin it). And, it’s clean! There’s no language and no violence. There is a romance in the story and a lot of feelings expressed. There is a lot of kissing, but it doesn’t go further than that. There is some relationship tension which makes it a little inappropriate for really young readers. I don’t want my ten-year-old reading it, even though it is clean. Rating: PG-13 Not for content really, because it is clean. There is that sexual tension and you think that it might go further than kissing (it doesn’t), but I just think it’s more appropriate for a little older reader. Recommendation: 14-15 and up. You may want to read it (because it’s really good) to see whether or not it’s appropriate for your child. It may be okay for a really mature 13-year-old. I love it when I can say that this is actually a good Young Adult book! Disclosure: I did receive a free copy of this book in exchange for my review. This does not sway my opinion as all my reviews are honest.